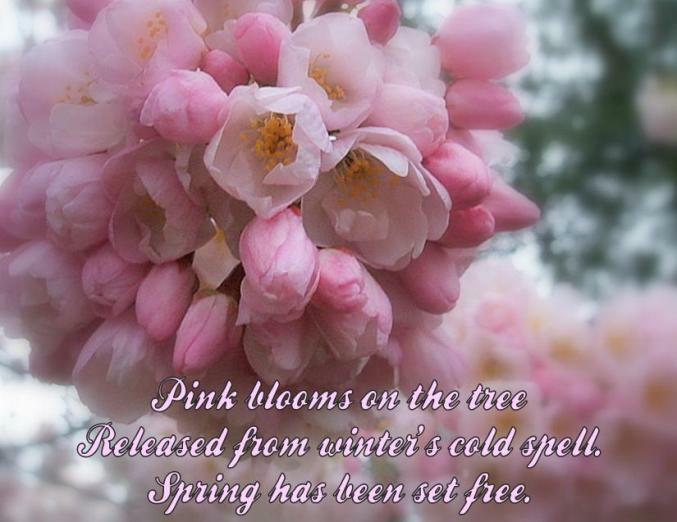 For more Spring Haiku delights, head on over to Pensieve! That is breathtaking ! And who would think to put their Haiku as a captioin on that fabulous photo? I love pink ! I’m going to wear pink today just because of you…and think Haiku, Haiku ! Gorgeous photo and poem! Oh how I wish spring would finally be set free here! Thanks for visiting! NO FAIR… okay. I’m just sad that I didn’t think to make a beautiful poster. Wow. Love it. Oh, Lana. Beautiful, simply stunning! The image and the imagery of the words. What a wonderful addition to the carnival this month. This will brighten the day of EVERYONE who happens across this post! Thank you for bringing beauty into the moment :). Oh wow – beautiful picture and haiku! I like that one! Goes very well indeed with the picture. Thanks for stopping by, Lana. This haiku is beautiful, as is the photo. Have a restful weekend!!! Thanks for visiting my post at Sacred Ruminations today and leaving the link back here. This post is just lovely! This is a beautiful picture. It spoke to me without the words, and then the words came, and one feels warm inside, more free like…spring. great idea with the picture! Love the haiku too. It really flows! That was wonderful! Picture and haiku were truly spectacular. Way to go, Sis.